Believe it or not, there are places, such as Canada, where milk comes in a bag. This may sound bizarre to some people, especially Americans, who are used to milk cartons and the occasional plastic jug. Interestingly, what may sound more bizarre is that until 1915, Americans used to buy their milk in glass bottles until a certain John Van Wormer from Ohio invented the milk carton which immediately took America by storm. When compared to glass bottles, milk cartons are lighter and easier to carry around and it is therefore understandable why Americans were more than willing to trade their glass bottles for Van Wormer’s milk carton. In spite of everything, it seems the popularity of the milk carton did not spread as far and wide as Van Wormer would have wished because Canadians seem to prefer the milk bag over the milk carton. It has also emerged that various grocery stores in the UK are trying out milk bags for a number of reasons. According to The Guardian, Sainbury’s, the 2nd largest chain of supermarkets in the UK, has already switched to milk bags as they contain 75% less plastic when compared to milk jugs which saves them a lot annually in terms of packaging. Other than the fact that milk bags are less plastic, they also come with many other benefits. For starters, they are reusable and are therefore environmentally friendly. According to the U.S. Environmental Protection Agency, more than 70% of plastic milk jugs in America end up in the landfill, which makes them a health hazard, not only to the environment, but to Americans as well. Also, milk bags are cheaper than cartons and plastic jugs because they require fewer resources and energy to manufacture. They also happen to keep milk fresher for long. 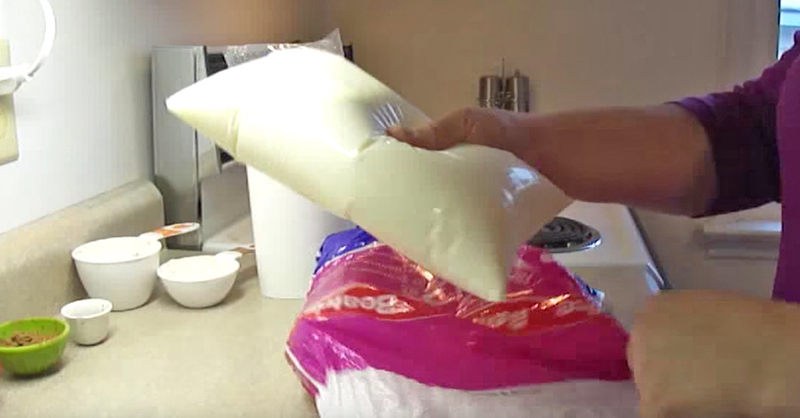 As the video below shows, milk bags, which go for around a dollar or less, are easy to use too. All that is required of you is to take your milk bag, plop it into a pitcher, slash a triangular hole at the tip and pour out your milk.